In this issue, we meet some of the locals who care about homelessness. 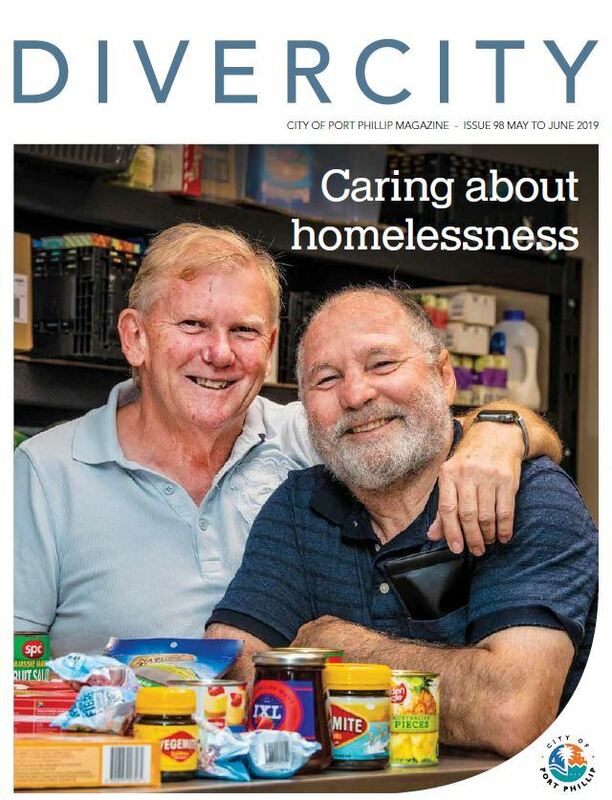 On the cover are Henry and Mark from Father Bob’s Community Pantry. There’s also Donna who helps out by using her skills as a hairdresser. We’ve also got handy contacts for agencies that care and a list of places to get a free feed every day of the week..
You’ll also get an insight into the day-to-day struggles from the crew at the Port Phillip Community Group. We also take a look at Wintringham, an aged care service right here in Port Melbourne that welcomes people who have struggled with homelessness. This edition also links seniors to a range of activities to keep them connected and social in the winter months and beyond. And just to show off our love of compost, we look at Veg Out Community Gardens and Council’s community compost waste reduction ideas. You’ll learn about green cones that will put your FOGO in the zone. Plus an amazing list of local events, including all the buzz from the St Kilda Film Festival. All this and more in the latest Divercity. From the colourful cover to the action packed event pages, Divercity showcases the style and substance of our neighbourhoods. 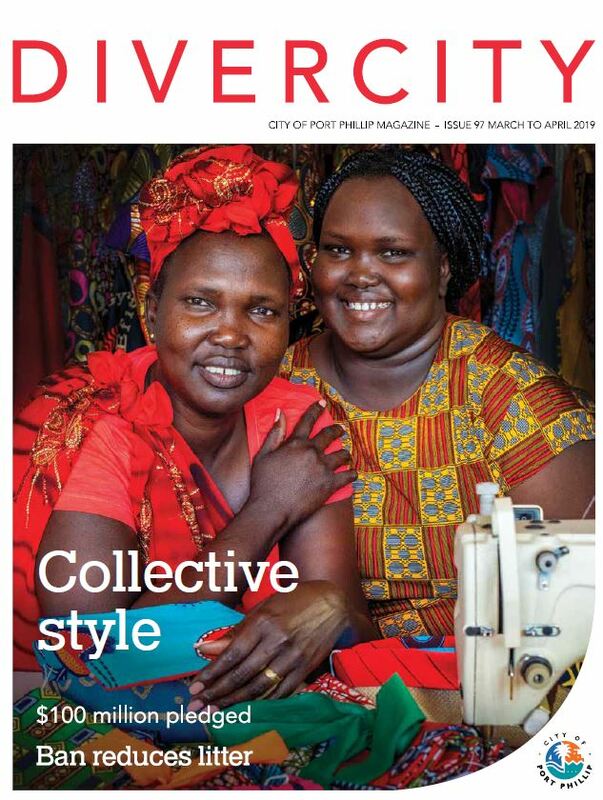 Meet Abuk and Afadang who bring the colour and style of South Sudan to life through their sewing collective. A few pages later, meet Susan and Ella who are leaders in theatre. Walk along the foreshore and you might stumble across David, a mathematician and artist reimagining paintings from the 19th century. Plus there’s a pond built by volunteers near a 700 year old tree with a great Indigenous story. There’s also a snap of eco-teens exploring the reefs of Point Ormond with the Port Philip EcoCentre team. And now there are more ways to better deal with e-waste – that ever growing collection of unwanted stuff we have in our houses, like old phone chargers, routers and alike. 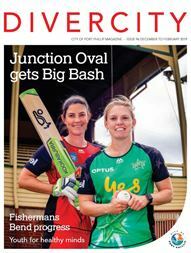 Catch a double dose of Women’s Big Bash cricket at the newly refurbished Junction Oval on the weekend of 1 and 2 December – it’s gold coin entry – howzat! Stay up-to-date with the beach litter and drinking rules to keep you and yours safe over the busy summer months. While you’re at it, put the Pride March (Sunday 3 February) and St Kilda Festival (Sunday 10 February) in your diary – and join in the celebrations. Are you thinking about doing some volunteering in the New Year? Council has a new volunteer’s portal with loads of ways to get involved. To get you started, we’ve listed some interesting volunteer ideas in a variety of fields. Read young people’s ideas about creating health minds – there’s a lot of wisdom on display. 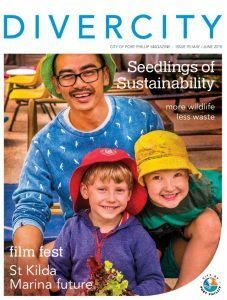 Events, progress in parks, recycling tips and more, all in the summer edition of Divercity. The latest Divercity is probably the most diverse we’ve ever produced – once again we showcase many ways that you can be more involved in your community. Join others as they reflect on the centenary of Armistice Day in 1918. There’s a new peace garden and several neighbourhood walks to visit sites of significance related to WWI. You can learn about the War through the service stories of people from Heath Street in Port Melbourne – it’s fascinating and brings to life the service, sacrifice and enormity of events a century ago. October also includes the Port Phillip Seniors Festival with three big dances to get feet tapping and hearts racing. Check the details alongside a range of other local events in October and November – including HOWLoween for doggies – woof woof. Meet the stormwater detectives from Council who are using robot mounted CCTV to explore our stormwater drains and keep them flowing – watch for their nifty electric vehicle in a street near you soon. 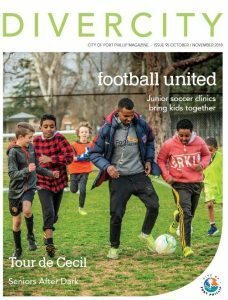 On the cover, you’ll also meet Kamal who runs free soccer clinics for youngsters in Port Melbourne. As a refugee arriving in Australian in 2003, he’s followed an interest in football to get involved (and employed) in his community. Now he’s helping others enjoy the beautiful game and get involved. Creatures from Port are taking over the world. Yes it’s true, ginormous realistic animatronics created by a Port Melbourne enterprise are being used all around the world. 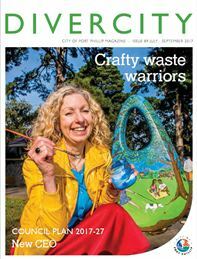 It’s just one example of the creative local stories in the latest Divercity magazine. You’ll also see the dynamic crew from The Arcade, a South Melbourne hub for dozens of people developing interactive and online games. It’s an amazing place with local expertise, ideas and creativity reaching out to a global audience. You’ll also meet musicians Ruby and Joyce who enjoy the creative scene and make music in totally different circles. We also see the artists in residence at Gasworks as they prepare for their annual exhibition. And to keep it colourful, we also feature Tracey and Sharifeh who are making fashion work in so many ways at space2b in Chapel Street. Plus plenty of local events and a few local characters from our many neighbourhoods, including Balaclava, Port Melbourne, South Melbourne, Albert Park, Middle Park, St Kilda Road, St Kilda, Elwood and Ripponlea. 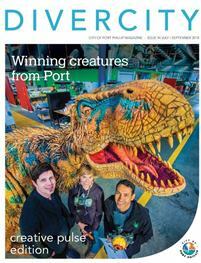 Divercity March – April looks at how Port Phillip is growing while striving to retain a welcoming local character. The cover features the fabulous new high rise school in the new neighbourhood of Montague. Rising five storeys high, the school includes Council managed maternal / child health services, a kindergarten and sport facilities. We meet seniors trying a new fitness sensation; join the weekly faith and food gathering at the Hare Krishna in Albert Park that’s open to all; get a glimpse of some of the top local designs that will be celebrated and awarded at the NGV in March; and look in depth at the new planning rules that promise to help retain neighbourhood character. 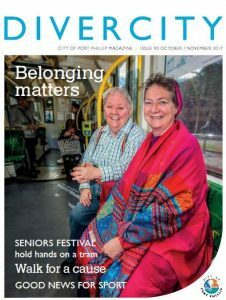 Combine this with a potpourri of local events, news from community groups and a preview of the new Pride Centre – and bingo – you have the next edition of Divercity. 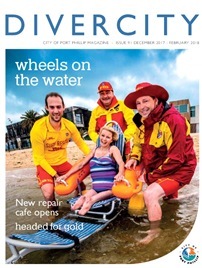 People with disabilities can now use beach wheelchairs to enjoy a dip in the bay at Port Melbourne and St Kilda beaches thanks to council and the local lifesaving volunteers. A new monthly Repair Café promises to bring new life to domestic appliances, furniture, toys and clothes. The people behind oBikes have signed a deal to make them work better. All this and dozens of local events in the December – February Divercity. 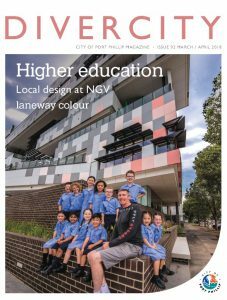 Divercity covers topics of interest to residents of Balaclava, Port Melbourne, South Melbourne, Albert Park, Middle Park, St Kilda Road, St Kilda, Elwood and Ripponlea. Divercity October – November 2017 celebrates the many ways our community invites participation and gives people more opportunities to belong. Sing in a choir, enjoy a night out, build a park and get seniors together for their very own local festival. We also reflect on the shameful arrest of two women in 1977 for holding hands on a tram. Their journey, and the stories of other women, will be told during a tram ride and afternoon tea during Seniors Festival. And, as usual, there are details of lots of things to do in our community: walk for causes, keeping active, arts & theatre and a host of seniors’ events. Meet locals who are reducing waste in very crafty ways. Georgie Faircloth and how her art on a crowd funded drinking fountain attracts people to refill rather than buy water. Leather worker Louise sells recycled leather wallets and more at the Esplanade Craft Market. While teams of people are making Boomerang Bags to help you say no to plastic bags while shopping. Don’t forget the pre-loved clothing at the new Greeves St. op shop in Belford Street, because changing your wardrobe could help change a life. You can also meet Peter Smith, the new Port Phillip CEO. His last gig was CEO at Adelaide City, so he’s got lots of experience and ideas. There’s more than 30 local events to tempt you out this winter, including the wonders at MAP57 of the St Kilda triangle and much more. Plus a lift out about the Council Plan. In letterboxes from 17 July.